Today the world lost a great man. Often times that statement is said whenever someone loses a loved one. Today is my turn to say it as today is the day I lost my grandpa or the man I named Papa. What makes someone a great man? I could talk about his experience in the military, the hardworking man he was on his farm, the husband of sixty-four years to my grandma, long time deacon of the church, or father to my mother and uncle. I won’t speak to those things. I know of them, some more than others, but my experience my relationship comes from that of a granddaughter speaking of her grandfather. You have all heard the expression of “your happy place.” “Go to your happy place, visualize your happy place.” This is used in order to calm you, to bring you back from stress, anxiety, frustration, anger, or various other emotions. My “happy place” has always consisted on one place; my Nanny and Papa’s house. I believe there are many reasons for this. Perhaps it might be Nanny’s meals, especially considering that she would spoil us and make us funnel cakes when my sister and I would stay the night. But mostly it was the feeling I had when I would stay at their house. The sense of peace, safety, and love I would experience in their home. The feeling that came from the two of them. My first memory I can recall involved my Papa. My very first memory involves Papa taking me down the stairs to their basement to where they for a time had baby chicks. As I grew older trips included fishing in one of the three ponds he would take me fishing on his farm. As I continued to grow it became countless hours sitting at the table playing games of Rummy, Payday, or some other game. One of my favorite memories from their old house is of a basketball goal. No, Papa wasn’t really one for sports so he didn’t spend much time shooting hoops. The memory stems from the love that goal symbolizes. This wasn’t just any basketball goal. It was a homemade basketball goal made by my Papa. He knew that me and my cousin Chad loved basketball. He made sure we had a place to play. Many hours were spent at that goal. Not to be outdone Nanny knew I liked Michael Jordan, I had a handmade Jordan Chicago Bulls jersey sewed by Nanny. Whenever I think of my Papa I will forever think of back scratches, fishing, good meals, his shop, and the as the stuff lovingly referred to it as “Papa’s junk.” Not every grandkid can say they had random trophies to play with simply because Papa found them at a sale. Of course with me and my active imagination they became sports trophies, beauty pageant trophies, Grammy’s, and whatever other idea I could come up with that day. I once saw a quote that said grandkids only stay young for so long because grandfathers only have so many horsey back rides in them. For me it was sitting at the feet of Papa while he rubbed and scratched my back. I observed the world at the feet of my Papa. I would sit there listening to the adult conversations around me, observing his collection of books and videos on the bookshelf by his chair, and eating too much candy from the candy dish that sat in between his and my Nanny’s recliners. I was content, I was happy at the feet of my Papa. Papa hasn’t been able to be himself for some time. Gone were the days on the farm or messing around in his shop. 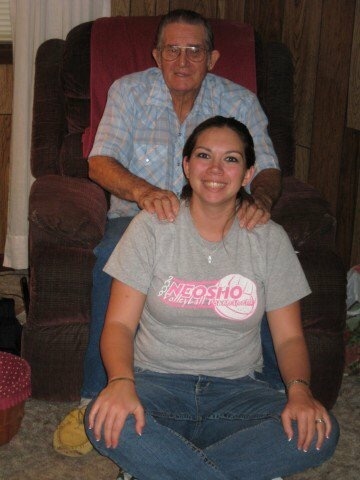 Gone were the days of fishing trips, games of rummy, and back scratches at his chair. While the last few years found him having health issues that kept him from doing the things he enjoyed it's still hard letting go. Papa while our hearts are happy knowing you are in a much better place, know that our hearts are still heavy for the great soul that is forever gone from this earth. You are now able to see, eat, and hear as you stroll the streets of gold and sit happy and content at your father’s feet. Such a sweet tribute about your Papa! I am one who never had a Papa, but I sure would have liked to meet your Papa as he sounded very special indeed. If I had a Papa I would have wanted one just like him. God Bless You and your beautiful family! Our thoughts and prayers are with you all. Love Uncle Truman and you. Thank you for this amazing walk down memory lane.